For my friend Ashley’s Bachelorette, we went wine touring. In addition to the party box I sent her in advance, I was also tasked with bringing a fun wine glass. Instead of buying a pre-decorated one for $15 or more, I made my own. 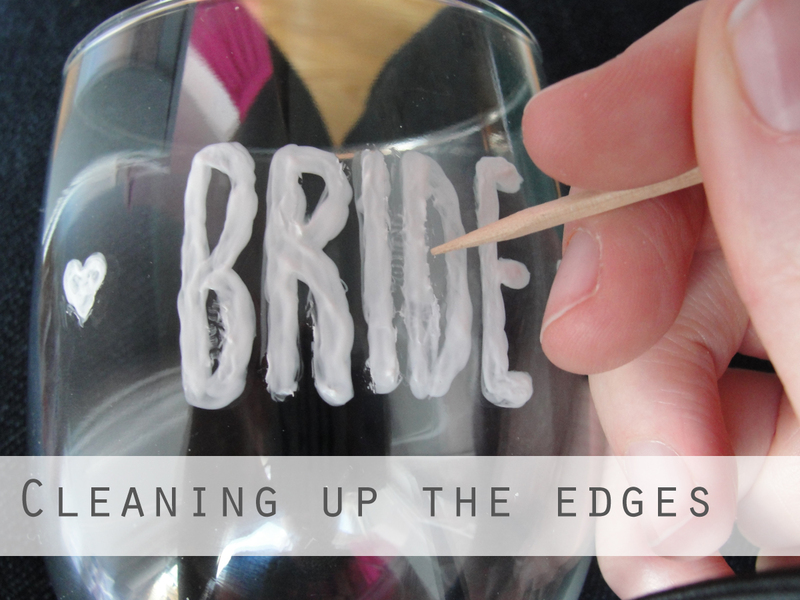 My initial idea was to paint “Bride” on the glass. I purchased white craft paint specifically for glass and ceramics. For the lettering, I printed out a design and taped it to the inside of the glass. This way I could just copy over the font on the outside, and didn’t have to rely on my poor handwriting. Using this paint on the glass was a bit of a disaster. It had poor coverage, and ended up a little streaky. I did the best job I could, and then cleaned up the edges with a toothpick. To set the paint, you need to cook it in the oven according to the directions on the container. However, to add insult to injury, the paint yellowed in the oven! I was a bit panicked since my plan wasn’t working out as well as I hoped. Luckily, the wine glasses I got came in a set of 4 for $5 from Walmart. I needed to come up with something as an alternative wine glass. 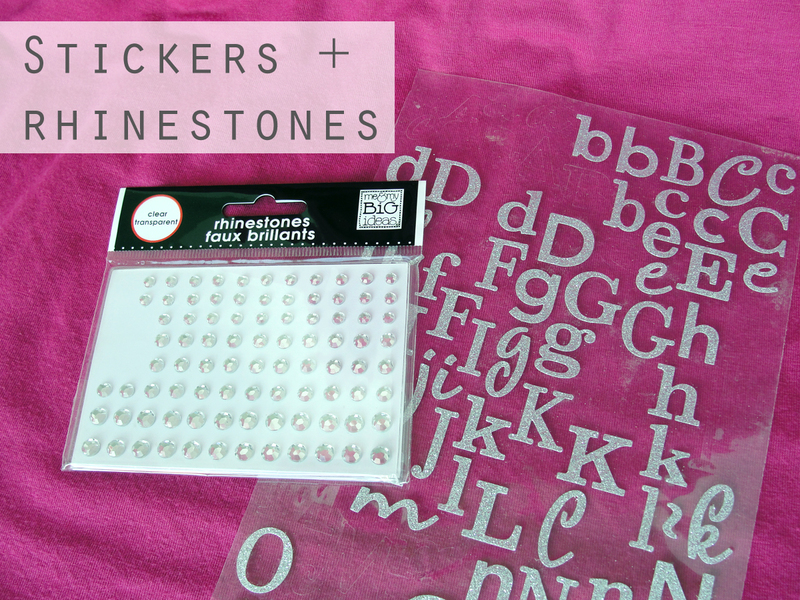 For my next try, I used scrapbooking stickers and gems. Obviously, this version is not dishwasher safe. However, it was extremely easy and turned out better than the painted version. 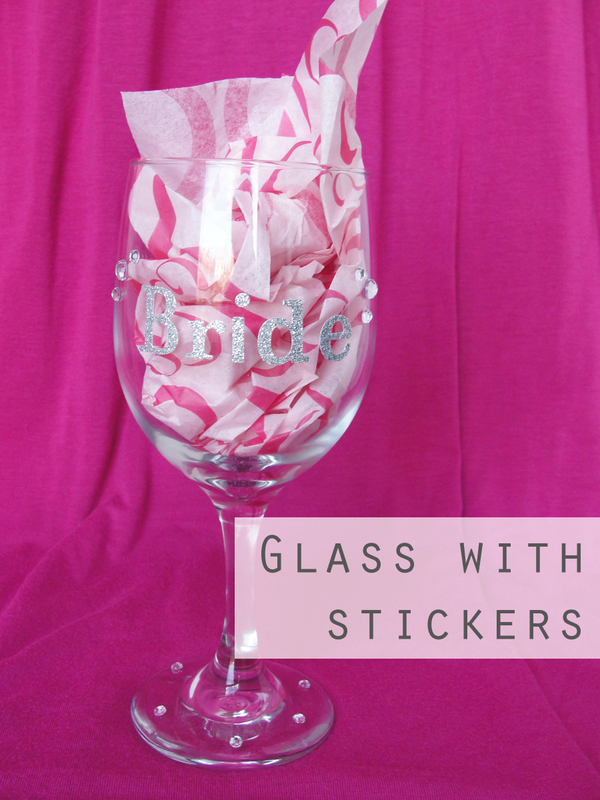 On the day of the bachelorette, I gave the bride a choice of glasses and she picked the sticker version. 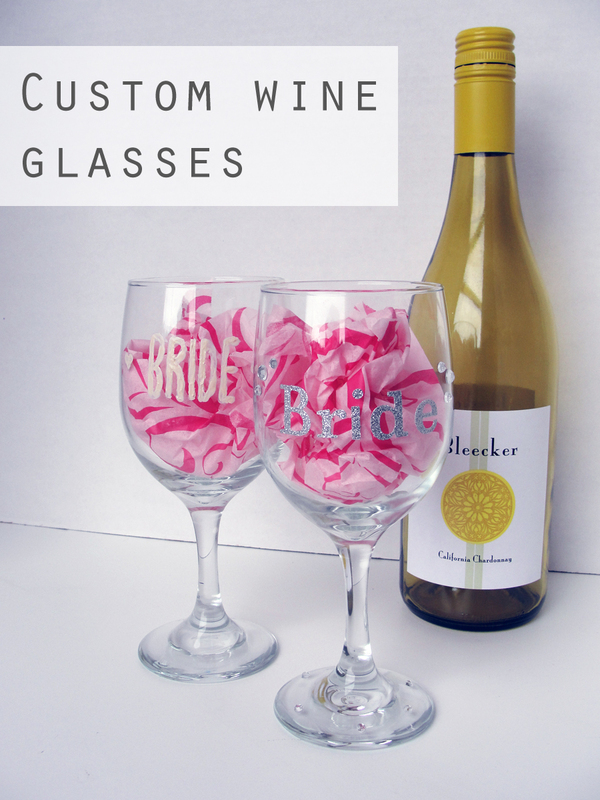 Coincidentally, the bride gave us all hand-painted wine glasses as party favors! 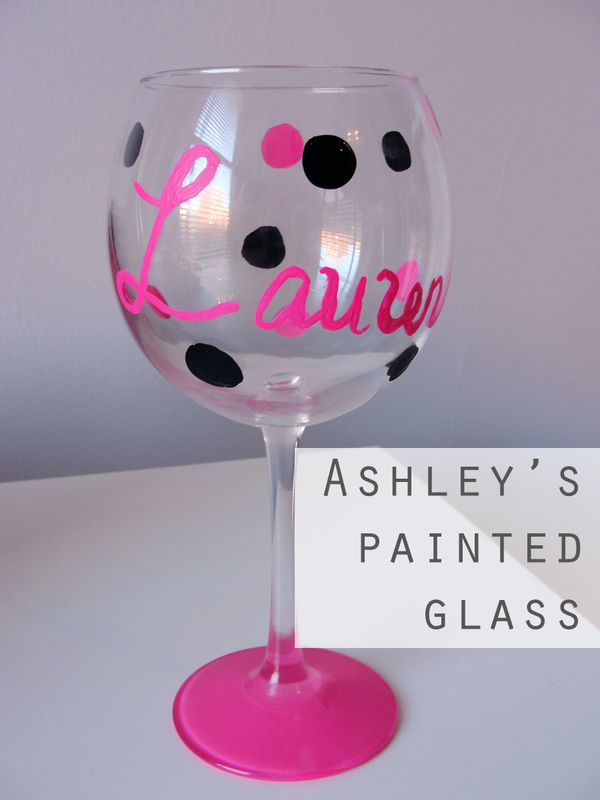 For mine, Ashley used pink and black paint to put my name in freehand script and added polka dots. I love it! Apparently she used Martha Stewart paint. Ashley did a great job! 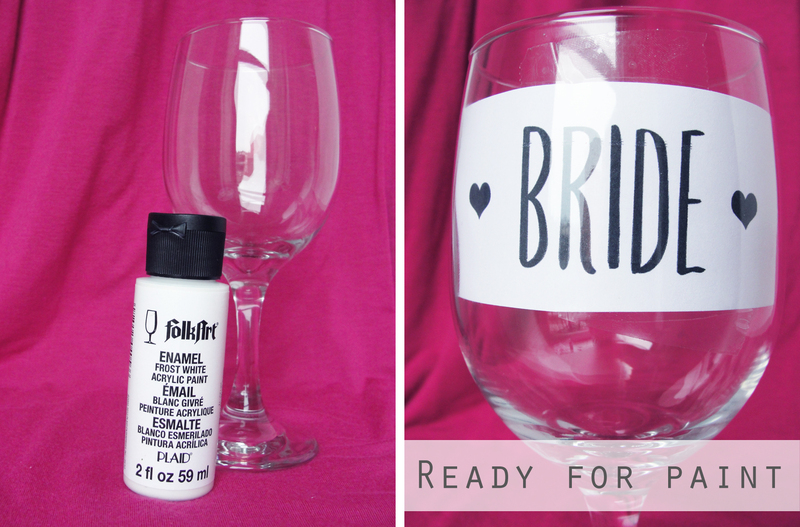 Even with Ashley’s successful wine glass, I’m still not sure I’m sold on ease of glass craft paint. I guess I’ll have to try higher quality paints next time. 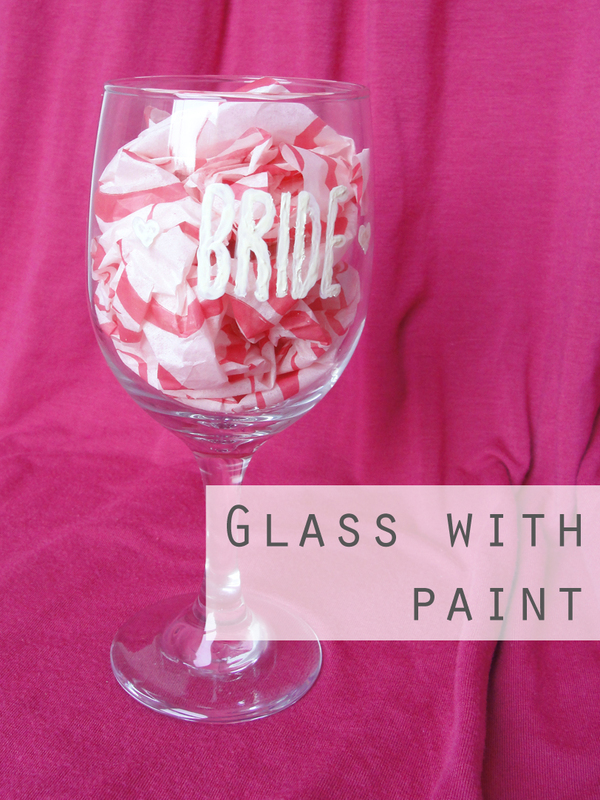 Have you ever painted on glass? How did it turn out? I would live to try painting on glass, but I am skeptical as to how it will really turn out. YOurs came out great. Thanks! It was a lot harder than I expected. I’d say to proceed with caution on painting glasses. Lovely idea. Sorry it didn’t come out quite as you hoped but I love that you share your successes and those that are not so successful. 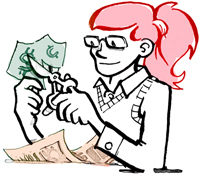 We can certainitly learn from the DIY mishaps of others. I know I’ve had my fair share. I’m glad you like my “fails” as well. I just want to be realistic about what’s working and what’s not.